To say that Different Worlds Issue #23 is one of the highest Superhero Themed Gaming Magazine issues of all time would be an understatement. 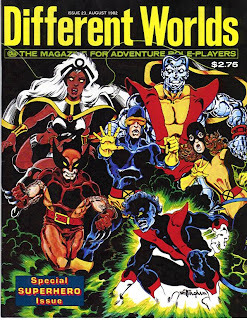 It closer to the truth to say that this particular issue of Different Worlds is one of the best -- if not the single best -- issue of a gaming magazine ever published. Issue 23, the "Special Superhero" issue, was published in August of 1982 just as superhero roleplaying games were beginning to emerge in the marketplace. 1977 had seen the release of Superhero 2044. This game was quickly followed by the release of the 1st edition of Villains and Vigilantes by Jeff Dee and Jack Herman and Supergame Aimee Karklyn and John Hartlove. By the time Champions emerged in the marketplace in 1981 at the Origins Game Fair, where it set a new standard in superhero gaming, the genre was well established as a successful gaming milieu. During the early 1980s, fewer gaming magazines were "House Organs" that existed purely to promote the products of the company that published the magazine. The vast majority of these magazines were published by gaming publishers, like today, but these publishers frequently featured articles containing content for their competitor's games and advertisements for their competitor's products. Dragon, The Space Gamer, and Different Worlds were published by TSR, Steve Jackson Games, and Chaosium but they didn't limit themselves to promoting their own products. Of these magazines, Dragon ran the fewest articles covering competitors' products but it contained a significant amount of external advertising. It wasn't until the publication by Steve Jackson Games' AutoDuel Quarterly that a company produced a magazine with the sole goal of promoting a single product line. If Dragon was the stingiest when it came to containing articles about other companies' offerings, Different Worlds and The Space Gamer were in heavy competition for which magazine was the most generous in supporting the hobby first and the company second. Both were excellent magazines that are sorely missed today. It is in this environment that Different Worlds issue #23 "hit the stands" and set a high mark for what a magazine could do in support of the hobby itself. If you were considering starting up a magazine that covered the whole RPG hobby -- I'm looking at you d∞ -- this is the issue I would point you toward to demonstrate how to do a themed issue. The issue had content that supported all of the major superhero roleplaying games of the day, had reviews of several of their products, and had reviews of some of the smaller emerging titles of the time. Superhero 2044: Part-Time Superhero -- This five page article, written by the game's designer Donald Saxman, provided designer notes for the game, supplemental rules, and an adventure that players could run in their own campaigns. The inclusion of a couple of new characters is helpful to GMs and players who want to use this system. 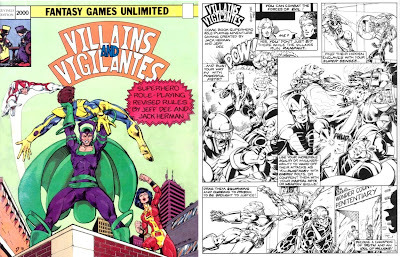 Villains and Vigilantes -- Pages 14 and 15 of the issue have a detailed discussion, by game designer Jeff Dee, of the history of the game and the changes that Dee and Jack Herman made to the system for the newly released (in 1982) 2nd edition of the game. Supergame -- Jay and Aimee Hartlove have a four page article that has a detailed discussion of the game's development and history. This article also includes Supergame conversions of The Incredible Hulk (Marvel), Raven (DC), Captain America (Marvel), Wonder Woman (DC), Batman (DC), Spider Woman (Marvel), and Wolverine (Marvel). This article prompted years of searching for copies of Supergame, a search that was not completed until 2002 when I found copies of the first and second edition at the War House in Long Beach. Modeling existing characters within a specific gaming system is one of the best ways to demonstrate what the benchmarks of a given game are and Jay and Aimee did a bang up job in this issue. They also discussed the limitations of their game. Champions has two articles back to back in the issue. The first is a set of designer notes by Steve Peterson. 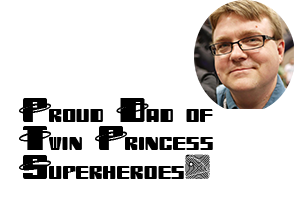 Modern Champions players may not be able to envision a day when Steven Long wasn't the man behind the rules set, and he has been a boon for the game, but it's nice to read what the creator of a game thought of his rules and how he wanted them changed for the second edition. The first edition of Champions was a 64 page rulebook released in 1981, Hero Games released a second edition of 80 pages a year later. That "revised" edition contained a number of significant changes. This second edition was the edition of the game I cut my teeth on, though the 4th edition was the one I played the most and still find to be my favorite edition. What is particularly praiseworthy in Peterson's notes is how responsive he was to how the game was being played. Given that he was a decade before the internet -- though there was a significant BBS community for the game -- it is even more remarkable. The second article for Champions is an article by Glenn Thain, a name you will find repeated in many of the early superhero rpgs and someone who has a knack for testing the limits of systems in character design, where he presents statistical representations for the John Byrne era X-Men. This article shaped the way that I viewed game balance for quite some time. In hindsight I think that Thain's fandom for the characters made him make them a little more powerful than they would have been written up by a more neutral evaluator. Regardless of quibbles, Thain presents some good guidelines to be used in individual campaigns that wish to model superheroes. Thain provides statistics for Sprite (Kitty Pride/Shadowcat), Storm, Colossus, Nightcrawler, Cyclops, Wolverine, and Magneto (giving one villain). Given the accuracy of the emulation of the abilities of the characters, this article is a great demonstration of the versatility of the Champions system -- even before it became a 900 page omnibus. 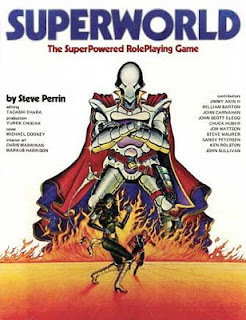 Superworld -- Given that Different Worlds was a Chaosium organ, one would expect to find a section discussing their superhero entry Superworld and Steve Perrin provides a nice designer notes and errata article for the first edition (the one in the Worlds of Wonder boxed set) of the game. Superworld is based on the Basic Role-Playing system, and as such has one of the most intuitive mechanical systems as its underlying structure. Tell someone that they have to roll 11 or less on 3d6 to accomplish a task and they may or may not understand what the probabilities of success are. Tell them that they have a 55% chance and it is instantly crystal clear. Superworld's system is a percentile based one. It is no wonder that this game became the basis for George R. R. Martin's shared world anthology Wild Cards. The game is versatile and easy to understand. The first doesn't have a large power set, but that was soon changed with a second -- and stand alone -- version of the game. Like Champions, Superworld gets an article wherein the X-men are modeled using the system. 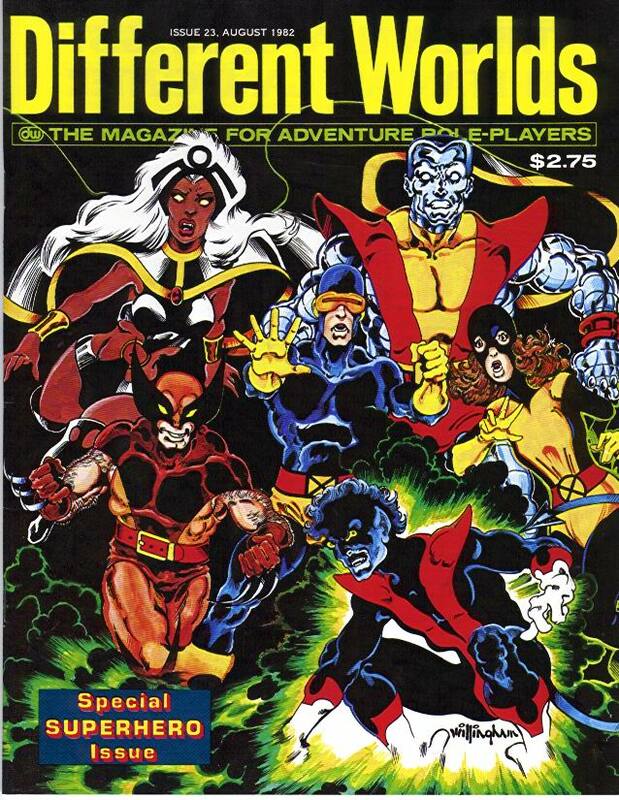 In this case the X-Men represented include a couple missing from the prior article. They are Angel, Storm, Professor X, Sprite (Kitty Pride/Shadowcat), Wolverine, Nightcrawler, Cyclops, Colossus, and Magneto (the villain). In the reviews section of the issue, there are reviews of Supervillains by Task Force Games (a deservedly negative review by Steve Perrin), The Official Superhero Adventure Game by Brian Phillips (a relatively positive review of the independently published game -- a game that I desperately wish to own), Death Duel with the Destroyers an adventure for Villains and Vigilantes (a deservedly positive review by Steve Perrin), The Ysgarth System (a mixed review of a game that became the foundation of a near impossible to find superhero rpg entitled Challengers). There are many other noteworthy aspects to the issue, not the least of which is the sweet Bill Willingham cover, so if you are a fan of superhero rpgs you absolutely must track down a copy of the issue. My personal copy is one of the "Collector's Reprints." I have a copy of "The Official Superhero Adventure Game." It's not necessarily for sale, but I might be open to scanning it and sharing a PDF "FOR EDUCATIONAL PURPOSES." If you're interested, you can email at the address included for follow-up comments. I would love to review a copy of that classic game for a history of superhero rpgs that I am working on.